A Thousand Days in Venice by Marlene di Blesi is the story of an American food writer and restauranteur who falls in love with a Venetian banker and moves to Italy. While the book is treated by critics and readers alike as a romantic tale, I saw something else: how di Blesi’s entrepreneurial spirit infected her new husband who ultimately leaves his dreary job. The City of Falling Angels by John Berendt was not the story the author was planning to write when he landed in Venice, but an intriguing city disaster led to this unusual glimpse into modern Venice society. The audio version is also good. If you love mysteries, American teacher-turned-writer Donna Leon has a series set in her adopted hometown. There are countless works of fiction and nonfiction covering all eras of this enchanting city. DK’s Eyewitness travel guide to Venice and the Veneto is fun to read, as is The Collected Traveler anthology of Venice, if you’re really curious. The Merchant of Venice has been made into film several times with the role of Shylock played by Sir Laurence Olivier and Al Pacino, among others. Dangerous Beauty is a personal favorite about an impoverished Venetian woman who becomes a courtesan when she learns that women in that profession have access to libraries. Based on a true story of the life of an early feminist. What exploration of Venice would be complete without Casanova? The 2005 movie with Heath Ledger as the legendary lover is charming and fun. Bread and Tulips is a movie that will be especially appealing to those who have visited Italy. And, of course, there’s the romantic classic, Summertime, with Katharine Hepburn and Rossano Brazzi. 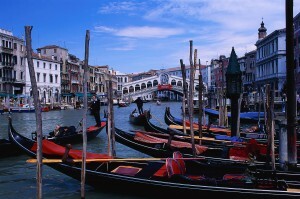 Even though I haven’t had much personal contact with Venetian entrepreneurs, there are two I will never forget. He bowed slightly and said, “I shall be here, Madam, awaiting your return.” I giggled all the way to the train station thinking that Claudio would be there to welcome me back. Then there’s Carlo. In October, 2006, my siblings and I rented an apartment in Venice for a week. When we arrived at the vaporetto stop, we were greeted by our temporary landlord Carlo. He shook hands with each of us and then escorted us back to the 500-year-old building he owns. The first thing I noticed about him was that he didn’t actually walk: he bounced. And he smiled a lot. The next afternoon he stopped by to make sure that things were running smoothly. “So, Carlo,” I asked, “where did you learn to speak English so well?” The grin got even bigger and he told us how he’d decided to learn English when he was sixteen and began his lessons by listening to Simon and Garfunkel. A few years later, he went to London and was dismayed to learn that nobody could understand him. We invited him to sit down and tell us more about this building which he was renovating. What followed was a delightful story about creative entrepreneurship. He told us he’d been a pharmacist, but when the building came into his family rather unexpectedly, he left his pharmacy to devote himself to his new enterprise. His parents occupied an apartment on the ground floor and there was another space he rented to a group of architects. Carlo lived on the top floor while the other four apartments were vacation rentals. Redoing the building had been a huge undertaking and he seemed to be enjoying it all. I tried to imagine how difficult it would be to rehab an old building in a city where everything had to be brought and removed by motorboat. It seemed daunting, but Carlo seemed to have taken it all in stride. When Carlo told us that he was facing a couple of off-season months with few takers, my sister Margaret suggested he advertise on Craigslist, which he hadn’t heard about. To our delight—and his—he promptly got two bookings after posting on that popular site. If there are more charming landlords and hotel owners than Carlo and Claudio, I have yet to meet them. Writers, painters and musicians have found inspiration in this elegant city. From William Shakespeare to Indiana Jones, Venice has proved a fascinating backdrop for storytelling. I'm sitting at my desk, getting ready for a science-themed magic show, class, or birthday party. My whole job is having fun with science. Science Outside the Box is a tiny business that celebrates the scientist in every one of us.